The Pull Out enhances the user's productivity. The Pull Out allows the work vehicle to be used for other purposes with total hauling capacity. The Pull Out eliminates trips to and from the vehicle. The Pull Out provides security for tools. 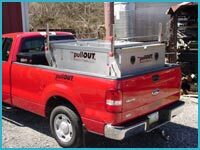 Introducing The Pull Out® Center Door Model, a large, stainless steel mobile utility box that fits into the bed of a pick-up truck and when removed, stands on hydraulic legs with wheels so that it can be easily moved to any location. Organizing and transporting tools to a job site has never been easier. 8 foot 48" 94" 34" 600 Lbs. 6 foot 48" 70" 34" 500 Lbs. The hand held Remote Control unit is the brains behind, the working of the 4 hydraulic legs, to put The Pull Out Unit in or bring it out of the truck. The Hydraulic Cylinders in the Center Door Pull Out unit are run by a 12 volt DC Haldex-Barnes motor unit. of the Pull Out and open upward in gullwing style. The average weight of a Pull Out unit is between 200 and 600 lbs. depending on the model ordered. All Pull Out units are made with 304 stainless steel. The stainless steel body is 11, 14 and 16 gauge. All hardware is stainless steel or chrome plated steel. The dimensions of the hydraulic model Pull Out unit come in 8' or 6' x 48" x 34" deep. Cargo Space from 70 to 100 cubic feet, depending on model. The Pull Out® is the perfect utility box for everyone. 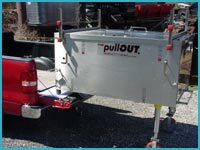 In minutes, the Pull Out® can be easily loaded or unloaded from the back of your truck. No longer will you have to make numerous trips back and forth from your truck onto a work site, wasting valuable time and energy hauling tools and equipment. With the Pull Out®, its one and done! 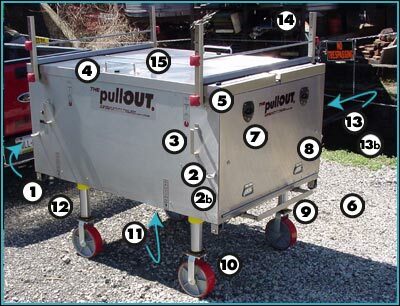 One person can unload the Pull Out®. 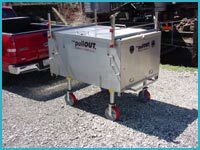 With its sturdy, drop down legs with wheels, the Pull Out® can easily be unloaded from your truck by just one person. 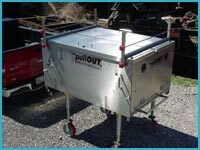 The Pull Out® can then be rolled anywhere it is needed at a job site. Plus, the back of your truck is now empty, freeing up valuable space in your bed to transport other equipment and materials. The design of the Pull Out® is simple and unique. It is the truly the mobile toolbox and work station for today's busy craftsperson of the 21st century. 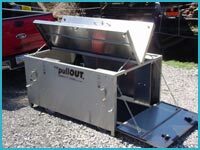 The Pull Out Corporation reserves the right to change the Pull Out unit styles, prices and accessories at their discretion.